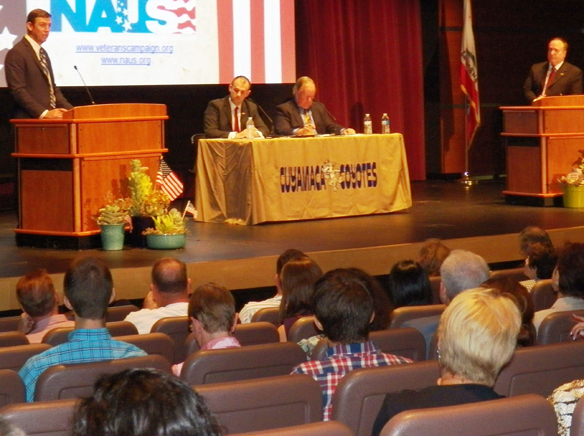 And Veterans Campaign came to El Cajon’s Cuyamaca College on Sept. 26, to sponsor a debate between the candidates for Congress in the 50th District, both of whom are military veterans. Debate moderators were Seth Lynn, one founder of Veterans Campaign, who noted that the contenders had “defended the right to express opinions” with their military service, and local political science professor Carl Luna, who also directs the Institute for Civil Civic Engagement. If this event is an indicator, Veterans Campaign may be on to a solution to overcome the partisan rancor roiling current-day political disagreements. The debaters were incumbent Congressman Duncan D. Hunter (R), of Alpine, and his challenger, James Kimber, (D) from the northern environs of the district. Hunter served in the Marine Corps, including three overseas tours as a field artillery officer after the 9/11 terrorist attacks. 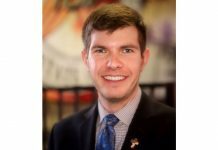 He was elected to Congress in 2008, becoming the first Marine combat veteran of the wars in Iraq and Afghanistan elected to Congress. Kimber served in the Navy, with 20 years on active duty and another 10 as a reservist, providing healthcare to other service members. Kimber now works as a physician’s assistant. The hour and half allotted for the debate allowed a series of wide-ranging questions, some from the moderators but most from public submissions online or from audience members. The first question was about cuts to the Defense Department budget. Hunter expressed opposition, citing national security needs for a strong but flexible force to protect citizens from attacks. Kimber was more amenable to paring defense spending, listing unwanted equipment and unnecessary facilities that military brass opposed. Kimber stated the need to “build for conflicts of the future.” Hunter described how the Air Force, heavy on pilots, had initially rejected support for the San Diego-built Predator unmanned aerial vehicle, as well as how the aging A-10 is the only close air support aircraft now in service, although first flown over 40 years ago, and how a replacement is therefore much needed. On another current defense issue, the two men were in agreement, supporting airstrikes in Syria and on Islamic State militants. Kimber jabbed at Hunter for voting against military aid to Syrian rebels. Hunter responded, “I voted against giving technology into unknown hands that might later be used against us,” continuing, “I am totally for bombing the hell out of ISIS.” The two further agreed on “no boots on the ground” in Syria. Kimber, who provided medical treatment to service members, focused on the military as a model for better provision of government services to citizens across the board. Hunter, the combat field artillery officer, emphasized the military in terms of its central role in national security. On jobs and the economy, both men mentioned the importance of agriculture in the 50th District, with opinions predictably diverging as to whether government regulatory actions are more helpful (Kimber) or more harmful (Hunter) to job growth and business success. Similarly for making education more affordable: Hunter discussed how government now controls student loan rates in such a way as to drive up college costs; Kimber mentioned his support for a proposal from Massachusetts Sen. Elizabeth Warren to change student loan repayment terms, so that graduates could refinance at lower rates. Hunter outlined his bipartisan and bicameral work with Oregon’s Sen. Ron Wyden and Florida’s Sen. Marco Rubio on the “Student Right to Know Before You Go Act,” requiring that colleges and universities receiving federal student aid dollars provide prospective students with hard numbers on graduation rates, student loan indebtedness and graduates’ starting salaries. On the “Affordable Care Act” (often dubbed ObamaCare), the two swapped partisan slogans, “support universal healthcare” (Kimber) versus “repeal and replace” (Hunter). By way of further explanation, Hunter stated, “Freedom works,” giving examples of individuals who had lost medical insurance policies they had wanted to keep. Kimber described persons he had counseled in selecting healthcare coverage under Covered CA and related that he was seeing more patients since enactment of the law. Kimber decried the existing condition of medicine, saying, “This should not be a profit-driven industry.” Hunter cited one method of introducing effective competition into the market as permitting residents of one state to purchase healthcare insurance policies approved by regulators within a different state. On energy and the environment, both candidates expressed support for alternative sources of energy. Hunter noted the fire dangers and neighborhood nuisances of backcountry energy generation, saying that solar and wind power should be located where “sensible” and not in conflict with camping and off-road recreation areas. Kimber criticized a new hospital that refused to implement solar panels in its design. On the California drought, Kimber noted local water board members he has consulted say that only about half of water used is being collected and recycled for re-use. 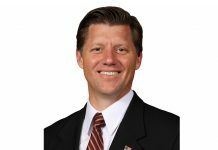 Hunter responded with praise for Kimber’s candid analysis, saying, “You should run for County Supervisor.” Hunter then cited the “indefensible” dry policies of “San Franciscans” holding back water supplies from farmers and ranchers in order to protect the watery habitat of the endangered delta smelt fish. Kimber homed in on the “waste of money in ignoring the drought” and danger of fires. On immigration, the candidates parted company in how to properly view the issue. Kimber sees this as government service to new immigrants who “have shown passion to be American,” stating support for the DACA policy of “Deferred Action for Childhood Arrivals” that amnesties youngsters from other countries who lack U.S. citizenship, and mentioning the high Latino population in the 50th District. By contrast, Hunter speaks about the issue in terms of border security and as a subset of national security, describing reports of Islamic State terrorists crossing the southern border of the United States, with possible plans for mass-murder terrorist assault in mind. Hunter further criticized unilateral extra-constitutional and behind-the-scenes actions banning enforcement of immigration laws, which prevented Congress from voting on the matter in full view of the American people in a way to be held accountable to the people for those votes.